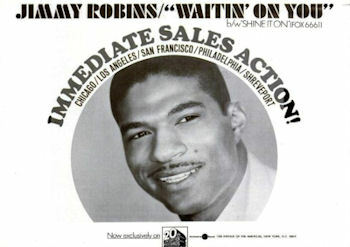 In terms of gruff intensity and roaring power few singers could match Jimmy Robbins. In my view he never made a bad record although his career was so fragmented - he recorded for several labels and under a couple of names - he's never really gotten either the visibility or success his wonderful voice deserved. Robins may just have been the best "underground" artist of them all and fully warranted his "Preacher" tag. In addition he wrote most of the songs he recorded and was a fine keyboard player, specialising in the Hammond B3 organ. 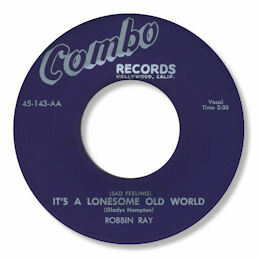 He started out as Robbin Ray with two singles on Jake Porter's LA based Combo label in the late 50s, with the blues ballad It’s A Lonesome Old World being particularly fine. This is a nice introduction to his work as he pushes out the decibels breaking into the occasional hoarse screams while the band play out the sort of riffs that Joe Scott was providing for Bobby Bland. The uptempo "Baby Baby Take A Look" is even more impassioned - a West Coast R & B workout to savour. Using his real name Robbins then cut an interesting series of sides for Federal under the direction of Sonny Thompson in Cincinnati. Sadly Thompson - whatever his success with artists like the great Freddie King - proved to be a rather unsympathetic producer. Robins' grainy rasp was as powerful as ever but Thompson smothered it with a large chorus of background singers placed way too high in the mix. Also Sonny's material wasn't as strong as Jimmy's own songs. The best of the bunch was "I'll Be There" which was based on the chord progressions of "Stand By Me" and on which Robins was given rather more scope. 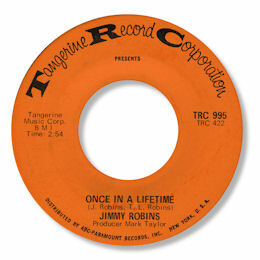 Equally as potent was Jimmy's next 45 which was cut for tiny Impression. The tracks were picked up by Bob Lee in Chicago who put them out on his Jerhart label with some differences in writing and producing credits. The pounding fire of "I Just Can't Please You" took off locally and made it onto the national charts eventually peaking at no 21 on Billboard early in 1967. This was Jimmy's only appearance on the charts sadly. The track remains a dance floor favourite to this day. But the flip I Made It Over is a masterpiece of deep soul and far more suited to this website. Robins is utterly magnificent, throaty and with a thrilling sense of dynamics, over a dead slow beat and some subdued strings. Sheer class. The follow up was a very lively "In My Heart" which I like a lot but buyers at the time didn't. Robins then moved to 20th Century for a one-off 45. Both sides were uptempo soul of considerable quality. the better one by a hair was "Waiting On You" but "Shine It On" (not the song cut by Vernon Garrett) was strong as well. But his next outing, another one-off for Kent, was simply extraordinary. 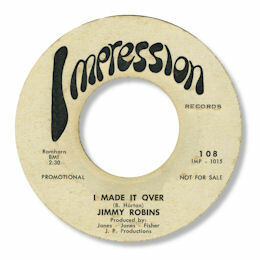 It's Real was a two part song which showed Jimmy's talents as a preaching storyteller as Part 2 featured an extended rap. Part 1 featured more of his singing so that's the side I'm highlighting here but I know many enthusiasts go for the other side. I love the meandering trumpet behind him and the lovely swirling organ too (Jimmy himself?). His only single for Ray Charles' Tangerine concern is another pinnacle of his career. Once In A Lifetime is a superb self-penned song beautifully arranged - just check out the piano and guitar touches and the masterful horn section - and Robins gives one of most emotional vocal performances, screaming and howling like a man possessed, but always in perfect control. Listening to it always raises the hairs on the back of my neck such is the impact it generates. Some fans think that Jimmy's 45 for Cliff Goldsmith's West Coast Convoy label is his best ever. Certainly So Confused is a 5 star cut - full of Jimmy's very best tales switching between sung portions and little raps - over a superb backing track, lovely organ touches, piano fills, a cracking West Coast horn section and a girl chorus. His falsetto bursts are amazing. By the 70s came around musical tastes had moved away from the heavyweight blues/gospel drenched vocal style that Jimmy was a master of in favour of other genres like funk. And his recording career tailed off dramatically with only a couple of 45s and an appearance playing piano on a couple of Big Joe Turner Pablo LPs. The 45s were for the small Ala concern and although he didn't sing on "Trust Your Child" it may well be his tasteful B3 organ we can hear behind Patrizia. But there was one final hurrah in the shape of the excellent For Goodness Sake which brought all his tale telling right out in front for the last time. This superb deep ballad is a direct descendant of his others from the previous decade - and just as compelling. His voice is still the marvellous instrument it ever was and the horn rich backing is a throwback to an earlier time. It was no wonder that this great recording didn't sell - after all it was a decade too late - but what a way to bow out of the singles market. 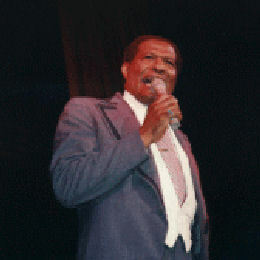 During the next couple of decades Jimmy broadened his career substantially appearing in shows like "Black and Blue" in which he toured Europe, and making appearances on film and TV shows. He also made a new home in New York with regular gigs at clubs like Showman's and Robin's Nest, in which he had an ownership stake. He sadly passed away on Christmas Eve 2007. If anybody ever asks you what deep soul is just play them any of the tracks featured here. I don't think praise for a singer gets any higher than that - and Jimmy fully deserves all the accolades that come his way. UPDATE ~ Eric LeBlanc writes to give Jimmy a birth date of July 31 1934 in Tarrant Co, TX with his real name as James Ray Robbins. As always I'm grateful to Eric for his excellent research. 1. Ace UK have reissued quite a few of Jimmy's recordings. All his Combo tracks - except the best one of the lot "It's a Lonesome Old World" - are on Vols 2 and 3 of "The Central Avenue Scene". Vol 2 also includes a previously unissued cut "Baby Baby Take A Look". You can find both sides of "It's Real" on "Slow n Moody Black & Bluesy" and "Pounds of Soul". A previously unissued Kent track "That Someone Don't Know It" is on "For Connoisseurs Only Vol 2" and the wonderful "I Made It Over" is on the fourth volume of "Dave Godin's Deep Soul Treasures". 2. 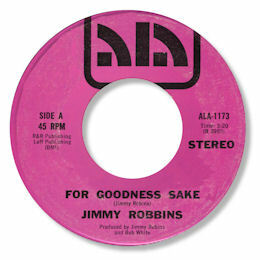 The discography only lists those tracks on which one or other of Jimmy's names is credited. 3. I've seen references to a version of "Take These Chains From My Heart" - was it ever issued? 4. Colin Dilnot (see Links) has featured Jimmy in his excellent blog "In Dangerous Rhythm" here. 5. Jimmy's internet page can be found here and his MySpace page here. There is also supposed to be a short video of Jimmy at a Harlem gig on this site here but I can't find it. 1. Bob McGrath (see Links) has written with details of the fourth Federal 45 which I'd misfiled. The discography has been updated. 2. 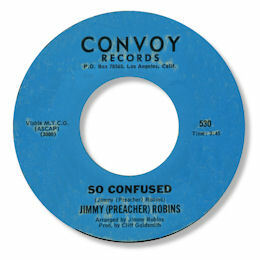 Mike Finbow and John Soul Smith have both written to point out that the Convoy 45 was recorded substantially later that I had shown it. I've amended the discography accordingly. I'm grateful to all correspondents.